All but the latest LED screens are still deeper than this image. I’ve nothing against any lack of liquid — the pub taps were still flowing, and a shallow stage of ducks is a hilarious soap opera I could watch all day from any number of beer gadrens– but it’s an example of how desperate a town can be for distinguishing features. And worse, how disappointing those features could be if they’re overadvertised. 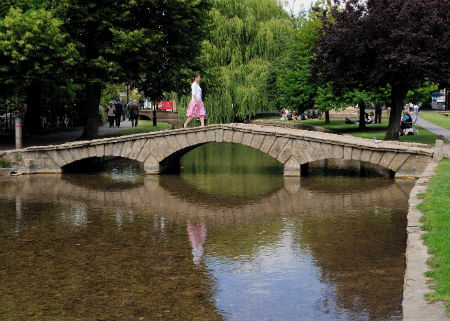 A town-long ankle wading pool is a cute feature, but anyone expecting a city of canals would look at the single solitary stream, almost superfluidic in its single molecule thickness, and think that they should have gone to Birmingham instead. And that’s a damning review of any holiday plan. In an age of internet navigation you’ll take anything that pushes you up the search rankings. But the result was a town overstuffed with shufflers meandering in and out of toy shops, all overbudgeting their two-hour “look at the canals” plan by about a hundred and nineteen minutes. 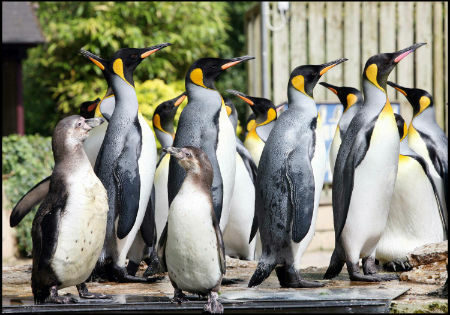 What’s worse is that such SEO shenanigans are unnecessary because Bourton-on-the-Water has Birdland, home of the Cotswoldian King penguins. There’s no moment like turning a corner in the English countryside to get a faceful of King Penguin. Alas, Birdland indulges in its own over-advertising, since a sign saying “The only king penguins in England and Wales” is really saying “There are totally king penguins in Scotland”. Simply claiming that you had the only King Penguins in England would have been enough — England doesn’t have any rival kings of any kind — but pushing the borders of what could be claimed only reveals the existence the Braveheart Kings who somehow still threaten Sassenach Spheniscidae superiority. This entry was posted in Uncategorized and tagged lukery. Bookmark the permalink.